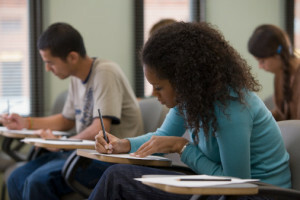 Home › FAQ › How are College Exams Different From High School Exams? If you are trying to familiarize with college academics, you will need to learn how college exams are different from high school exams well before you enroll in your first semester of classes. While both college and high school classes are designed to prepare students to become contributing members of society, the environment and the approach are entirely different. It is important that you realize that high school is designed to prepare you for college, but you are considered an adult once you walk the line and apply for college admission. There will be no hand holding, no parent intervention, more lenient attendance policies, more independent study time and less one-on-one attention. In addition to a new schedule and a new delivery of instruction, you will need to prepare yourself for much more challenging tests once you enter a higher education institution. Not only is the content of a college exam more difficult to grasp, the results can have a greater impact. Read on, and learn about the differences so that you can dedicate an adequate amount of time to your studies from the moment you step on campus. In high school, a teacher will cover a lesson and then test you on the coursework and content that you have completed in that lesson. You may also take chapter quizzes to be sure that you are comprehending the content as it is covered. In college, you are not going to take an exam on every single chapter or lesson that is covered. Instead, you will take exams on multiple lessons or modules every couple of months. Since much more covered material that is stale in your mind is covered on an exam in college, you will need to focus on study sessions and refresher to be sure you did not forget what you learned at the beginning of the term. It is not out of the ordinary for a college professor to ask questions from assigned reading or from something that you were instructed to do but did not cover in class. This is a move that the professor makes to ensure that you are following along with the lessons and doing your part as a college student even when you do not have to complete a written homework assignment. Many high school tests and quizzes include multiple choice or true/false questions that are easy to answer when you have done your part. While college exams may have these same types of questions, you will be expected to use your critical thinking skills to answer the question. College professors expect you to apply what you have learned instead of regurgitating information on paper. One thing that all prospective college students needs to know is that there is no option to miss an exam. If you miss your exam and you are given a zero, there is a good chance you will not pass the class because of how much weight is placed on your test scores. In some unique scenarios where you have planned ahead, professors will let you schedule the test on a different date. Be sure that you know that test preparation and studying is typically done out of class when you take a big college exam, according to Campus Explorer. Now that you know how college exams are different from high school exams, it is time to embrace the change and prep for post-secondary studies.